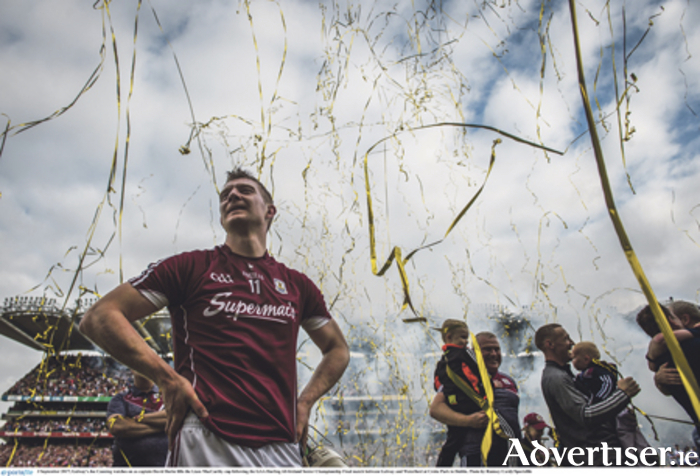 Galway supporters lucky enough to have been in Croke Park on Sunday afternoon witnessed history being made, with the county winning its fifth senior All-Ireland hurling title - their first since 1988 when Conor Hayes led the team to All-Ireland glory. Twenty-nine years later David Burke was the captain leading his county to All-Ireland glory that claimed the Liam McCarthy Cup with a show of top-quality middle to long-range shooting to which Derek McGrath’s Waterford had no answer. Galway hit 19 points from play compared to Waterford’s nine, and with nine different scorers, they were fully deserving winners of the 2017 All-Ireland final. Amazingly, Micheál Donoghue’s team for a fourth consecutive game did not raise a green flag. No goal in almost 300 minutes of consecutive championship action is rare, but it did not matter a jot to the outcome as Galway came home on a scoreline of 0-26 to Waterford’s 2-17. Galway started like lightning on Sunday and six maroon players had all fired over points in the first eight minutes. They were to go another eight before they had any wide, which shows top-class decision-making as well as accuracy when needed. Waterford looked in deep trouble early on until Kevin Moran beat Colm Callanan on his near side after five minutes. The Deisé appeared to have settled at that stage as Galway hit the next three points. Cathal Mannion and Canning hit their second scores, and then Conor Cooney hit another. Team captain David Burke stroked over his second point after 20 minutes to make it 0-10 to 1-4, and Galway were moving smoothly. Waterford were thrown a lifeline with Kieran Bennett’s freak goal but Galway’s Joe Canning replied with a sweet side-line cut. Despite having been the dominant team in many positions, Galway only led by a single point, 0-14 to 2-7 at half-time. Waterford did go ahead in the second half, but Niall Burke’s power and ball-winning ability made a difference on his introduction and won a scorable free on his arrival. At 2-12 to 0-17, it was Waterford who looked to be getting into their stride a bit, but Niall Burke squared things up once more, then added his second a minute later to nose Galway in front. Canning and man-of-the-match David Burke with his fourth point gave Galway added belief. Despite a few Waterford scores, the arrival of Jason Flynn added oxygen to Galway’s burst for glory. Flynn’s two points were key scores and they put Galway in touching distance of the winning line. Getting over the winning line in an All-Ireland, however, is not always straightforward. After 29 years of waiting, there was some totally understandable nervousness and a few errors in the last quarter that kept Waterford in touch with Galway giving away two silly frees and handy points. It seems approriate that it fell to Joe Canning to take Galway’s last belt of a ball in the final minute from a side-line cut before Fergal Horgan called time and Galway were once again All-Ireland senior hurling champions.